Colour woodblock print, o-tanzaku. Signed and sealed Koson. Very good impression, colour and condition, 366 x 189 mm. Tiny 'Made in Japan' stamping on the verso. See Amy Reigle Newland, Jan Perrée, Robert Schaap, Crows, Cranes & Camellias, the natural world of Ohara Koson 1877-1945, 2010; K43.6. 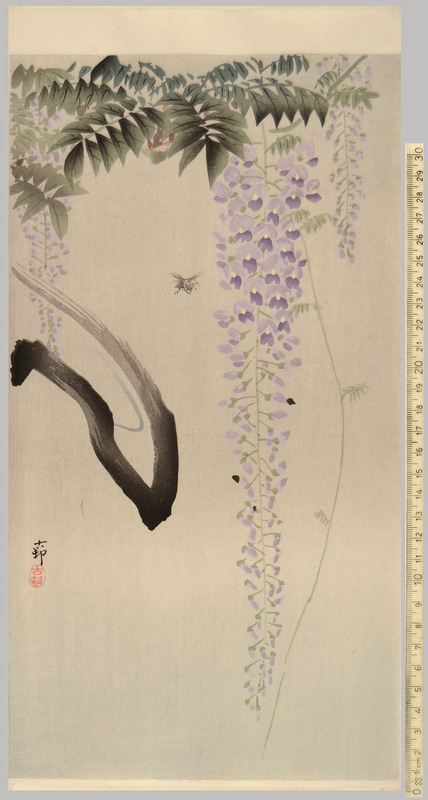 Originally named Ohara Matao, the Japanese painter Ohara Koson probably studied painting and design in his native Kanazawa. He subsequently adopted the name Koson from his teacher, the artist Suzuki Kason. 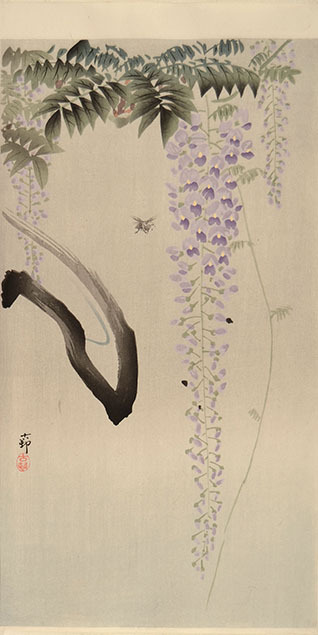 In the mid 1890s Ohara Koson moved to Tokyo, a city where Western influences were increasingly prevalent. He taught at the Tokyo School of Fine Arts, but was encouraged by Ernest Fenollosa to design woodblock prints. His subjects were invariably from nature, a particular favourite being birds. Koson changed his name after 1910 to Shoson, and later again to Hoson. Ohara Koson is considered by many to be the foremost 20th century designer of bird and flower prints, or kacho-e. His designs were produced in prolific numbers for a primarily Western market and range from haunting realism to humorous depictions of animals at play.